This week we began our hands-on explorations to see how magnets can pull some objects from a distance. Parents and students, please feel free to give me feedback on the site, positive or critical. Help me iron out the creases during the implementation phase! You can contact me anytime via the contact form on the HOME page. Today we used magnets to explore whether or not they attracted a range of items which were made from different types of metal (except the rock). The items were - a coin, permanent marker, bulldog clip, butter knife, rock, copper, zinc, aluminium foil and a tin can. 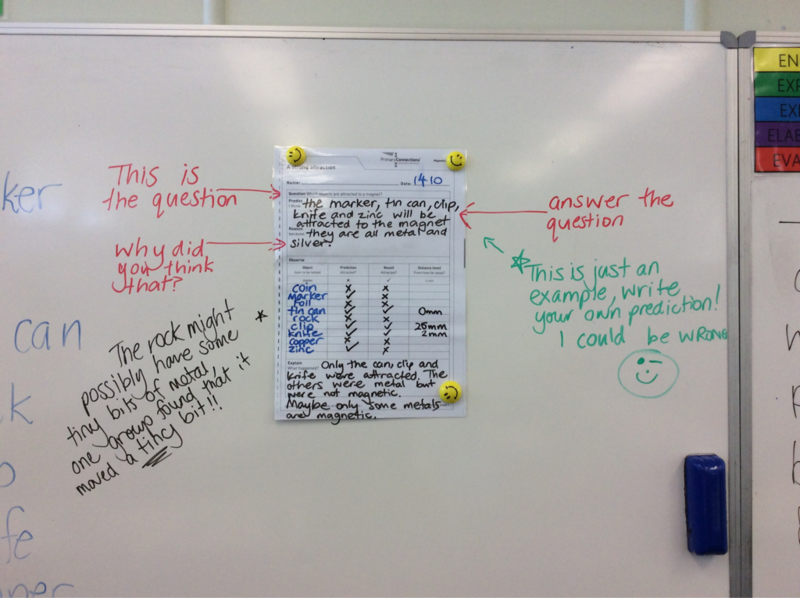 Before we began, we predicted which items we thought would be attracted by the magnet, and gave a reason for that prediction. Then we worked in groups and played around to test all the objects. We also tested to see if the magnet could pull the item towards it from a distance. We were surprised to discover that some of the items that we thought would be attracted to the magnet were not. We still have not discovered why that is yet, but some of us think that maybe it has something to do with how much actual metal is in the objects, or if it is a heavy or a light metal. Mrs Marini said we will find out soon.